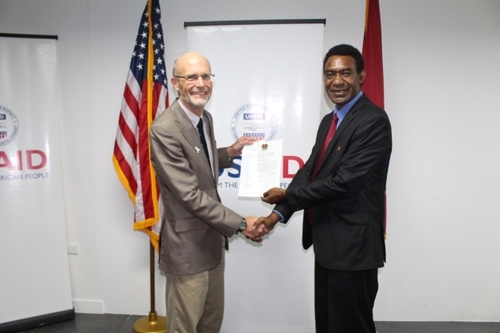 U.S. Embassy, Port Moresby: Ambassador Walter E. North, on behalf of the United States Agency for International Development (USAID), received the Aid Status Certificate from the Government of Papua New Guinea (PNG), officially recognizing the agency as an Aid organization under PNG’s Aid Status (Privileges and Immunities) Act of 1977. “Today’s event marks a significant milestone as we continue to strengthen the strong bond between our two countries, one that formally began in 1975,” Ambassador North said. Ambassador North cited the U.S. Government’s major push to increase its engagement across the Asia Pacific, building on the long and strong historic ties of the United States to the region. "USAID has played an important role in supporting the U.S. Government initiatives that advance stability and prosperity throughout the Pacific region." USAID Mission Director for the Philippines, Pacific Islands and Mongolia, Susan K. Brems, PhD joined Ambassador North and USAID Regional Coordinator for the Pacific Islands Richard Edwards in the ceremony. “Today’s event is the culmination of years of coordinated work by both our local staff and our government counterparts,” Dr. Brems said. This trip marks her first visit to the region as the Mission Director for the region. The United States is partnering with PNG and 11 other Pacific Island nations to build lasting resilience to the negative impact of climate change, help stop the spread of HIV/AIDS, and strengthen democratic institutions and promote good governance. In PNG, the U.S. Government is implementing five USAID programs on climate change adaptation and mitigation, health and welfare-related services for key populations, and peaceful and inclusive elections and referendums in the Autonomous Region of Bougainville. The U.S. Government works closely with Pacific Island governments, regional organizations, bilateral and multilateral donors, the private sector, civil society organizations, and communities, incorporating local knowledge alongside best practices from around the world, to make lasting impact. In PNG, USAID projects are aligned to the national government’s development policies and priorities. “We look forward to continuing and further strengthening our partnership to promote sustainable and inclusive economic growth in Papua New Guinea,” Ambassador North said. For more information about USAID efforts in the Pacific region, including Papua New Guinea, please visit www.usaid.gov/pacific-islands.